The global mobile phone installed base has decelerated sharply this decade to roughly 3% annual growth, a pace that may be sustainable for a few more years. In this context, demand for new phones is already overwhelmingly driven by replacement activity. Steady increases in Asian replacement, and an iPhone related pop in N. America, have seen phone sales rebounding recently, but we expect future global replacement rates to deteriorate particularly given the market shift toward emerging economies. The recent trend toward annual trade in plans could partly offset replacement declines in some markets, but will increase the supply of 1-2 year old used devices, threatening the trade-in economics in time. We also expect new mobile phone ASPs to tilt lower, tempering the expected 3% CAGR in units to less than 0.5% growth in industry revenues. What growth there is will come from low end smartphones, with basic feature phones falling from 34% of total unit sales to near zero by 2020. With this dynamic and a concurrent damping of product differentiation, we expect ambitious Chinese and Indian brands (Huawei, Xiaomi, Lenovo, Micromax, Spice, etc.) to benefit to the detriment of the companies that currently dominate the premium smartphone market (AAPL, Samsung, LG). Mobile phones are a mature market. In 2012, after decades of double digit growth, the global base of mobile phones abruptly decelerated, falling sharply from 16% to 3.1% in just 4 years. With most countries already showing near ubiquitous phone ownership and less than 1% annual growth in their adult population, future installed base growth will likely have to come from the less penetrated and faster growing emerging economies in Africa and Asia. All in, we expect the total global installed base of mobile phones to grow at a slowing 3.0% CAGR through 2020. Replacement drives phone sales. The percentage of phones sold needed to satisfy the growth of the user base has fallen precipitously over the past few years, from more than 30% in 2011 to less than 9% in 2014. As the global base appears very unlikely to reaccelerate, future demand for mobile phones will come overwhelmingly from existing users replacing their devices. Replacement rates vary wildly by region, with ~50% of North American’s upgrading their phones in a given year compared to less than 25% in Africa. Moreover, replacement rates also vary year to year with changing market conditions – North American replacement rates jumped 680bp in 2014, not coincidentally the same year as the iPhone 6 introduction. Chinese replacement bumped up 340bp in 2013 and has remained elevated since. Used market may crowd out some replacement. The shift from carrier subsidies to installment purchase plans in the US is an obvious negative for replacement demand. To counter this, AAPL introduced its own installment plan with the twist of an annual trade-in. Carriers have mimicked this approach, leading many observers to predict further acceleration in replacement. We are skeptical. First, few consumers have opted for similar programs that have been offered. Second, the economics of a trade-in program depend on a robust market for used phones. If the trade-in plans are successful in driving replacement, they will also boost the supply of used phones, pressuring prices and destroying plan economics. Used premium smartphone sales are currently ~19% of the new device market – lower secondary market prices would also squeeze out demand at the lower end of the premium segment. Little to no growth in new phone sales. With replacement rates in N. America, Asia and Middle East/Africa at all-time highs, it is difficult to expect the current 4%+ unit growth as sustainable. We believe that the market will settle in to 2.5-3% annual growth over the next few years, as network advances make mobile service realistic in parts of Africa and Asia and as the world adult population continues to expand ~1.25%/yr. With the market growth overwhelmingly driven by low income populations, with the pressure from the expanding used device market, and with less effective product differentiation, we anticipate global ASPs falling ~2% per year, yielding industry sales growth of ~0.5%. Shift to smartphones and 3G/4G is still meaningful. Smartphones were about 2/3rds of mobile phones sold in 2014, a share that is rising very rapidly. With quality smartphones available below $100 and an active second hand market, we expect sales of feature phones to fall off precipitously, allowing nearly 9.3%/yr unit growth in smartphones, almost all of it coming from the low end segment. Factoring in falling ASPs tempers this to a 2.1% CAGR. Along with the shift to smartphones, the next 5 years will also see carriers phasing out 2G networks, still serving ~60% of global subs, in favor of the more spectral efficient 3G/4G standards. Less differentiation. Smartphones are becoming more homogenous, as the factors that were once the biggest points of differentiation – e.g. screen size and resolution, processing power, camera quality, app availability, etc. – generate diminishing returns. The platforms and OEMs have strived to fill the gap with new capabilities, such as mobile payments, 3D Touch, Google Now, edge displays, etc., but it is not clear that these technologies have resonated enough with consumers to drive purchase decisions. The rise of Chinese brands. 2015 has seen Chinese brands Huawei, Xiaomi, Lenovo and Vivo break out, consolidating domestic share and moving aggressively into international markets. With growth centered on emerging markets and value-priced smartphones, we anticipate a dramatic shift in global market share toward these vendors and away from established brands like Samsung, HTC, LG, Nokia, Blackberry and others. The Chinese may be joined by even newer Indian vendors, like Micromax and Spice, competing at even more aggressive price points. Little growth available for AAPL. 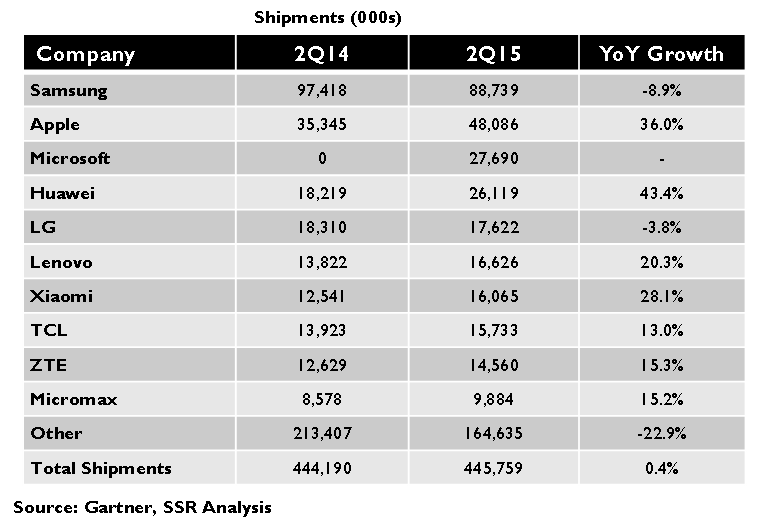 Consensus projects AAPL FY15 revenue growth of 28%, driven by the wild success of the iPhone 6. While management frames its success as share gains, the data suggests that much of this growth may have come from pulling replacement forward. N. American replacement jumped 680bp to 53.9% of the installed base in 2014, with a further increase to 54.8% estimated for 2015. After 6 months of sales, AAPL announced that 20% of its base consisted of upgraded iPhone 6s, with CIRP estimating that 40% of the US base had upgraded. These figures are far ahead of market upgrade trends, and given the preponderance of iPhones in the used market (also included in the installed base), there is likely FAR less upgrade runway than many presume. 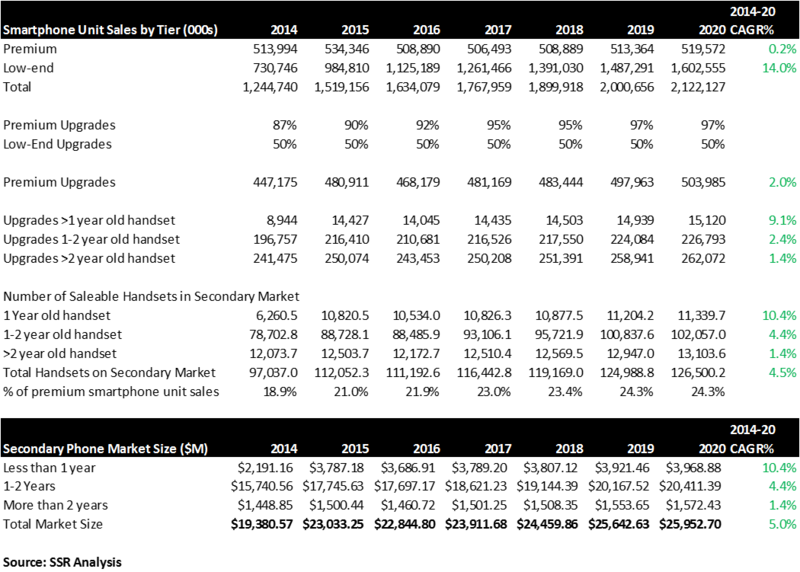 The premium smartphone market is likely nearing long term stasis, bad news for AAPL which depends upon it for growth. Component suppliers still have room. While the maturation of the premium segment is unequivocally bad for smartphone component vendors, growth is still available in lower tiers for 3G/4G focused players. We see opportunities for SoC vendor QCOM, and sensor players like INVN and SYNA, and a broader market for GOOG’s services bundled with its Android platform. There are more than 5 billion mobile handsets in use in the world today, more than 4 times the number of cars on the road, 2 ½ times the population of PCs, and within shouting distance of TVs worldwide. Annually, more than third of the base of mobile phones is replaced, driving demand for nearly 2 billion new devices in 2014 and making it the world’s most purchased item of technology by a fairly long shot. The epic size of this market and its unexpected usurpation of swaths of utility from other devices and services, have made smartphones the primary vehicle of the modern economy. Mobile commerce, social networking, streaming media, on-demand transportation, and many other revolutionary services have been catalyzed by and/or are dependent on smartphones. With a market this big and a product this important, why does the smartphone business seem so tired? The global installed base was still expanding at a 15.9% pace in 2011, but has slowed abruptly to an estimated 3.1% this year. This is saturation as much as anything else, Europe and North America have more mobile phones than people, while the rest of the world has penetration of better than 65%. We project the total base to grow a bit more than 2.75%/year through 2020, about double the rate of growth in the adult population, with almost all of the growth coming from less penetrated developing nations. As a result, the market for new phones has become very dependent on replacement. Of nearly 2 billion phones projected to be sold in 2015, just 7.6% will go to fuel subscriber growth. Luckily for some phone makers, replacement has been robust of late – in 2015 37.4% of the world’s phones are expected to be replaced, up from just 33.2% in 2011. This has been driven both from a steady increase in the propensity to upgrade in China and the rest of emerging Asia, and from a sharp pop in North American and Japanese replacement in 2014, most likely driven by the iPhone 6 introduction. These replacement rates will likely trend downward as the degree of differentiation in new handsets seems to be eroding and carrier subsidies are being phased out in some markets. Trade-in plans that allow annual upgrades are dependent on robust pricing for 1-2 year old phones may buttress replacement in those markets, but if they are popular, an influx of used premium smartphones to the secondary market could compromise those plan economics while squeezing out midrange upgrades in foreign market. We are forecasting 2.25% annual unit growth through 2020, but note that almost all of the growth will be at lower price points in developing economies. That, and robust competition from aggressive Chinese and Indian manufacturers, will drive ASPs lower, leaving industry revenues with scant 0.3% growth. The success of those manufacturers (e.g. Huawei, Xiaomi, Lenovo, Vivo, Micromax, Spice, etc.) 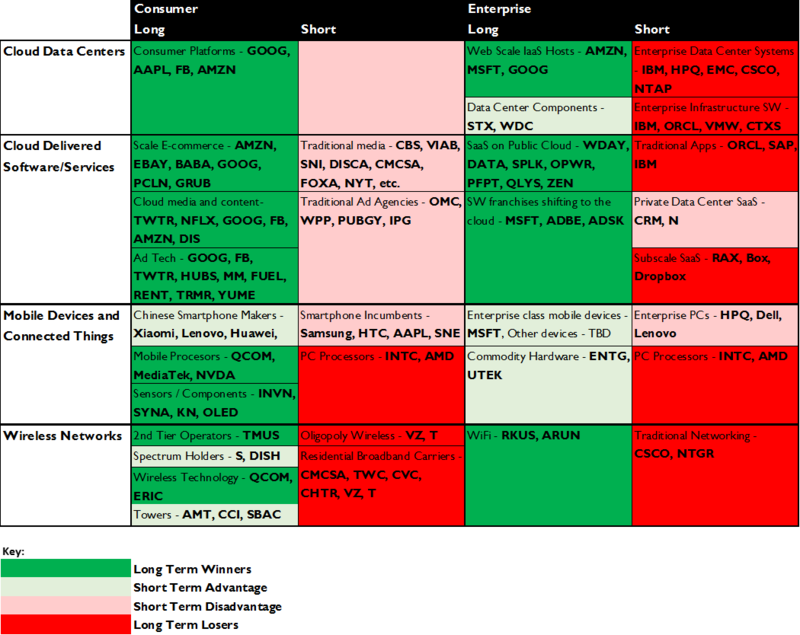 will likely squeeze established brands – Samsung, LG, HTC and even AAPL. We believe that the extraordinary success of the iPhone 6 pulled significant upgrades forward, putting AAPL in a very difficult spot in a stagnant market. Component suppliers may have a slightly rosier picture, in so far as the current market is still 28% feature phones and 23% 2G single mode. As the market shifts to nearly 100% 3G/4G smartphones over the next few years, the market for component suppliers, like QCOM, SYNA, and INVN, that focus specifically on that segment could benefit. This last leg of growth would also benefit GOOG, whose Android platform will power the large majority of these devices, and the leading cloud-based apps able to sell services to the already massive global base of smartphone users. The first US cellular phones began selling 1984, more than 4 years after the launch of cellular service in Japan, and 3 years after the launch of the Nordic Mobile Telephone network across Denmark, Finland, Norway and Sweden. American cellular was late, but it made up for lost time. By the end of 1985, there were 340 thousand subscribers, with the now iconic $4,000 Motorola DynaTAC 8000X “Brick” the most popular model. US subscriptions hit the 1 million mark by mid-1987. 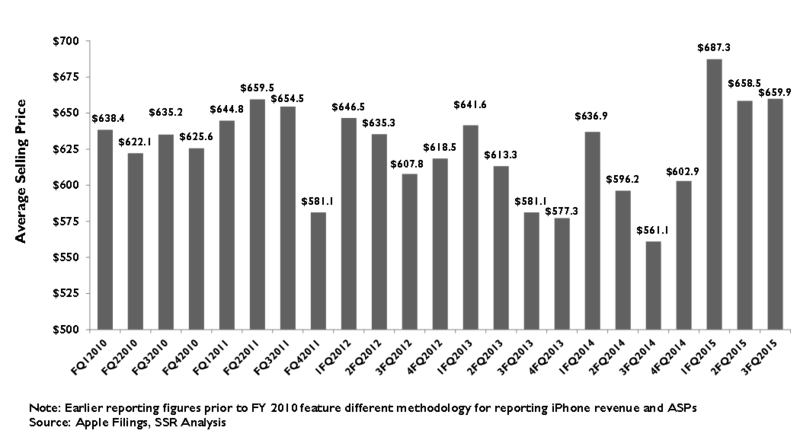 Global adoption accelerated in the early ‘90’s with the introduction of 2G digital systems, led by the European GSM standard. 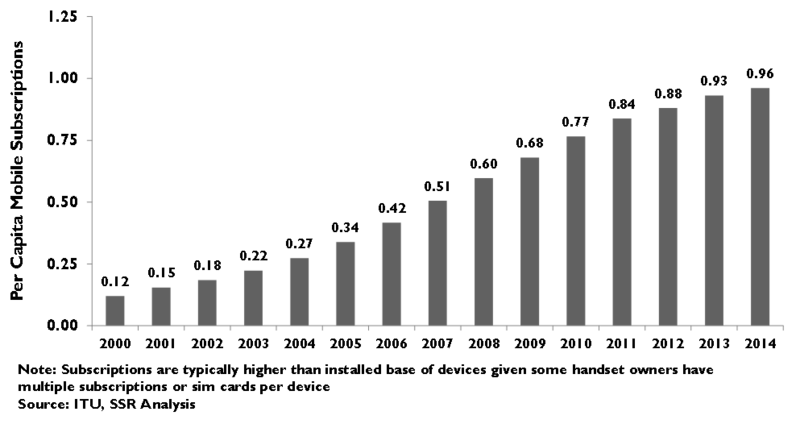 Global subscribers hit the 100M mark in 1996 and 1B in 2002. Today, there are nearly 7 billion mobile subscriptions (Exhibit 1-3). Culling out the extra SIM cards that allow users to switch subscriptions on their phones and non-phone subscriptions (tablets and “Internet of Things”), we believe that there is a global installed base of just over 5 billion mobile phones in use, a 5,000 fold expansion in less than 30 years. 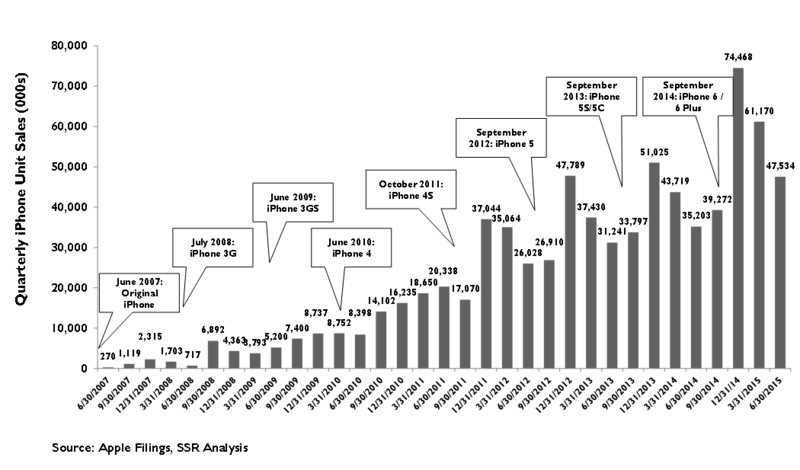 With that history, it is fair to say that the mobile industry is accustomed to growth. As of 2011, the installed base of mobile phones was still growing at a robust 15.9%, with new subscribers accounting for 32% of phones sold worldwide. However, since then, growth in the global installed base has slowed dramatically – 6.9% growth in 2012, 4.5% in 2013, 3.6% in 2014, and an estimated 3.1% this year (Exhibit 4-5). Europe, North America, Japan and South Korea account for nearly a quarter of the global device population with more mobile phones than people – the installed base in these markets has been completely stagnant for two years. China, which had been the bellwether for global mobile installed base growth, saw the growth of its phone population fall below the world average in 2014. With Chinese device penetration now at well over 80% of its 1.38 billion population, it seems optimistic to expect a change in course. 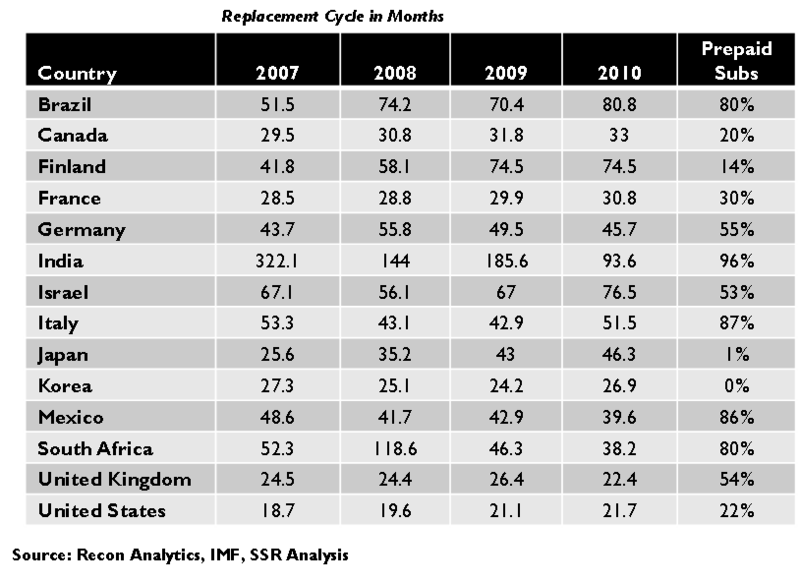 The only markets that are still showing meaningful growth are Africa and emerging Asia. In these geographies, penetration remains below 70% with installed base growth still above 5% in 2014 (Exhibit 6). Mobile phone ownership in these geographies has been decelerating as well, but not as steeply as the rest of the world. The obvious caveat is that these regions are also the most underdeveloped in the world, with the vast majority of the globe’s desperately poor. Initiatives to lower the cost of entry level handsets and basic service are unlikely to make enough progress to spike demand growth over the next few years, although we do anticipate that these markets will deliver 70-80% of installed base growth. That growth is expected to contribute about 150 million units to phone sales in 2015, down 10% from 168 million units in 2014, which was down 16% from 200 million units in the prior year. Considered against the total number of mobile phones sold in each year, the percentage contribution from installed based growth has dropped from 32.4% in 2011 to just 7.6% this year. Despite this ominous trajectory, we are projecting mobile phone penetration to decelerate very slowly from here, settling in between 2.5-3%, still well above the 1.15% growth rate of the global adult population (Exhibit 7). With demand from growth in the installed base withering, mobile phone sales depend heavily on replacement by existing users. Here the story has been quite a bit rosier. In 2011, about a third of the world’s mobile phones were replaced by new models. 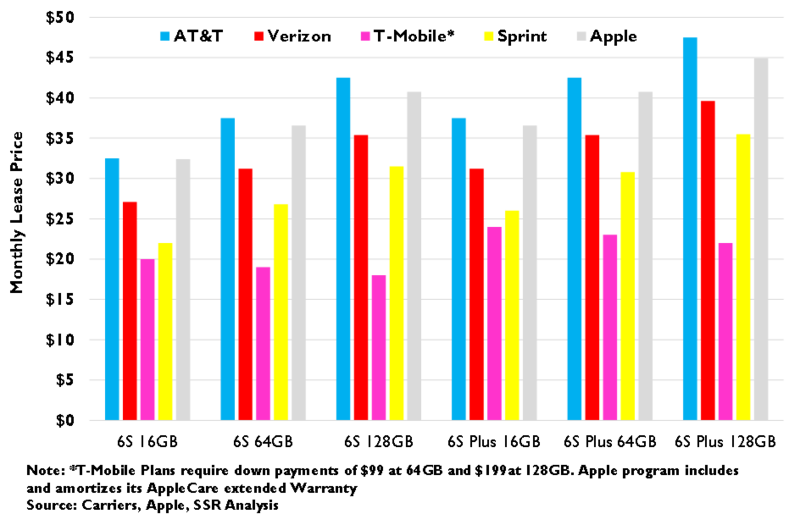 By 2014, that percentage had risen to 36.5% and it is expected to rise again this year to 37.4% (Exhibit 8-9). This surge in replacement activity appears to have two main drivers. First, replacement in developing Asian markets, including China and India and representing almost half of global handset demand, has steadily increased over the past four years to roughly 41% annual turnover today, considerably higher than the replacement activity in Western Europe or Japan. This is remarkable, given the low per capita income figures across the region, and raises obvious questions about its sustainability. We expect Asian replacement activity to trend back toward international averages going forward. The second factor in the rising trend is the extraordinary jump in 2014 North American replacement, up 680 bp to 53.9% of the installed base. We believe that this 25 M unit jump was driven almost entirely by pent up demand for Apple’s large screen iPhone 6 and 6 Plus models pulling replacement activity forward. We expect that replacement will remain high for 2015, but expect it to fall back to more normal levels below 50% thereafter. We have modeled global replacement activity to regress back to roughly 2013 levels, or 35.9%, by 2020, noting that this is still a substantially higher rate than we had observed at the beginning of the decade. Combining this with our expectations for growth in the installed base yields a top down forecast for roughly 2.6% annual growth in mobile phone unit shipments. The absurdly high US phone replacement rate is really a product of Apple’s genius. Ahead of the introduction of the first iPhone in 2007, Steve Jobs and company convinced AT&T, which had been bleeding market share to its archrival Verizon while it executed a painful network transition, to provide an extra subsidy and unprecedented product control in exchange for exclusive rights to the fledgling smartphone. Apple timed its product upgrades to the two year subsidy cycle favored by its carrier partner, bringing out new models each year on a predictable basis, but alternating “big” design changes with smaller upgrades in the off years. The extraordinary popularity of the iPhone locked AT&T, and eventually, all US carriers into heavily subsidizing upgrades at least every two years. As a result, the North American replacement rate, at roughly 50% of subscribers each year, is the highest in the world by a large margin. However, starting in 2013, T-Mobile led the industry in moving to abolish subsidy plans, replacing them with no-interest installment financing for phone purchases (Exhibit 10). These new plans separated equipment spending from service fees, providing consumers a financial incentive to keep their existing phones past the end of their financing plans. The other US carriers have since followed, eliminating the costly subsidy plans in favor of T-Mobile-like installment plans that amortize the value of the phone over a 2 year period and billing for services at a separate, lower rate. We expect that these new plans may actually extend smartphone life cycles as price conscious consumers will be likely to keep their phones longer instead of continuing to pay the additional $20-40 in monthly device amortization. According to Recon Analytics, replacement cycles for phones in countries without subsidy programs have historically been more than double the 22 month average replacement rate in the US (Exhibit 11). Then there are the early upgrade and phone leasing programs announced over the past couple years that are intended to appeal to customers motivated by frequent upgrades. T-Mobile was the first mover unveiling its “Jump” leasing program that allows consumers to pay a flat monthly fee to have the latest phones. When a consumer elects to upgrade to a new device, they return the old working phone to the carrier or keep the phone after the principal is paid off. 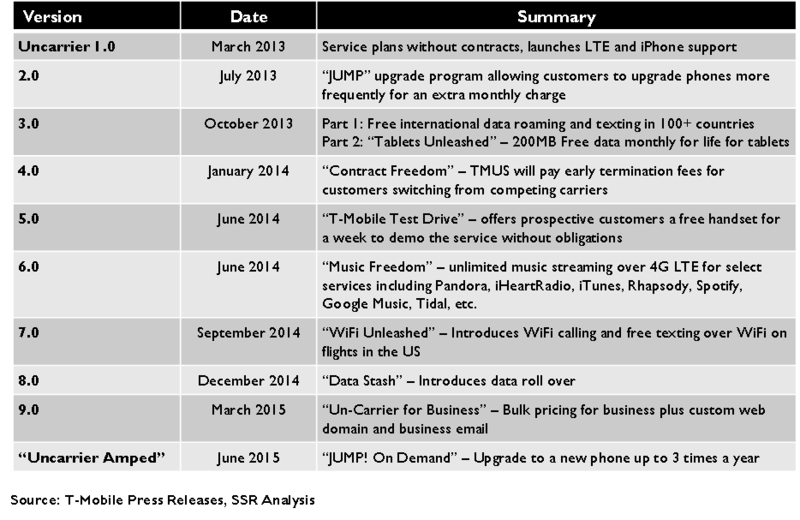 Both AT&T and Verizon followed with similar upgrade programs known as “Next” and “Edge” respectively. Verizon though killed its Edge program in May 2015 following its move away from device contracts, though it still offers trade-ins and upgrades. AT&T is moving full steam ahead with Next, which allows a customer to trade in and upgrade a device after a certain number of installments have been paid. Once a customer is eligible, they can trade in the device for a new one while the installment plan is reset to reflect the new device. The customer doesn’t receive any residual value for the phone unless it is fully paid off. Rounding out the carriers, Sprint is aggressively offering its “iPhone Forever” leasing program, where it is absorbing most of the phone amortization in a bid to stem sub losses. For carriers, handset incentives represent a way to capture new customers at the expense of other carriers. 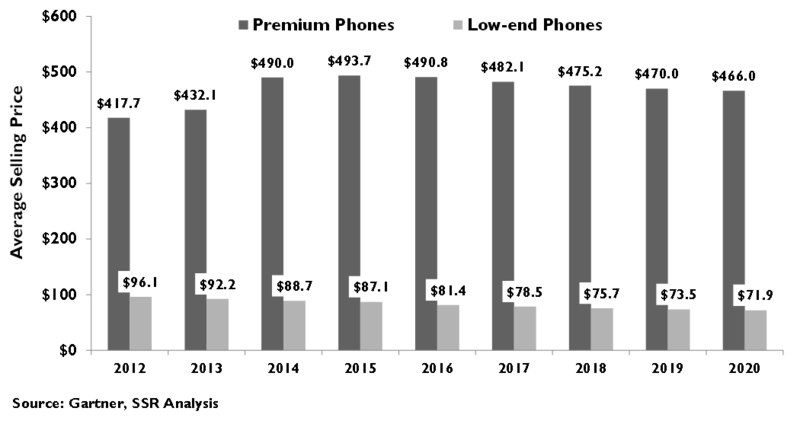 Margins on equipment are low compared to those made on services. Carriers don’t have nearly the same incentives to drive replacement cycles shorter as OEMs. It was no surprise to see Apple get into the upgrade/leasing business with the launch of its “iPhone Upgrade Program,” which amortizes the value of an iPhone bundled with an AppleCare extended warranty over a 24 month period (Exhibit 12). While the nature of these trade-in programs promises upward pressure on replacement and suggests a future flood of used premium smartphones in the secondary market, it is not clear that they have really addressed the needs of most consumers. A July 2015 Gallup polls showed only 2% of consumers upgrade their phones when a new handset becomes available every year, while some 54% of respondents will upgrade only when their phone stops working or becomes obsolete. 44% indicated they will only upgrade when their contracts allow or their phones are fully paid off. AT&T has had some success growing its Next customers to 37% of its postpaid smartphone base, but in the midst of a wireless price war, consumers seem to be opting for lower priced and longer term installment plans like AT&T Next 24, which amortizes a device over 30 months and allows upgrades after 24 months. If this continues, we would expect replacement to continue its downward trajectory. If, instead, the trade-in plans gain real traction, the scenario gets a bit more complicated. The economics of trade-ins depend on robust prices in the secondary market – the provider of the plan can keep monthly payments low based on expectations that the phone can be resold for real money when it is turned back in. Obviously, an influx in the supply of used premium handsets calls those expectations into serious question. As such, we see any support for higher replacement from these programs to be relatively limited. In developed markets, the demand side of the secondary phone market is modest, driven by very price conscious consumers and by those replacing phones after damage or loss. “Like new” previous generation iPhones and Galaxy devices are usually only discounted by $100 vs. new devices, providing little relief in the case of an accident. Squaretrade, a company that offers device protection plans, found that some 30% of iPhone users damaged their phones within 12 months of purchase, with 26% of iPhone users having cracked screens and 15% continuing to use their phones with a cracked screen. 71% of iPhone users don’t have insurance to cover the costs of repairing or replacing a phone. Apple’s own extended warranty will service the device after two accidents, but doesn’t cover loss or theft. Going with a used phone is often the most cost effective way to replace a premium handset meeting an untimely demise. Premium smartphones have a high rate of reuse, with Gartner reporting that 64% of such handsets are ultimately reused via trade-in, private sale, or hand me down, while 23% are either unused or recycled. Most demand for secondary premium phones comes from emerging markets. The CEO of used device trader Gazelle has indicated some 50% of the used handsets it collects end up in the Hong Kong resale market, while 20% go to wholesalers in other markets, and 30% are resold directly by the company via its website or third party channels like eBay. These sales of used phones in developing markets cannibalize new phone sales and here is where a bump in supply would have its biggest impact. We estimate that annual unit sales of used premium smartphones are running at roughly 19% of the number of new premium smartphones sold worldwide (Exhibit 13). If this were to meaningfully rise, it would have a substantial impact on global industry sales. We are not modeling a significant shift, but see it as a major risk to our market assumptions. The rising tide of smartphones across global markets and the pricing gains won by Apple’s most recent iPhones has driven rises in the blended ASPs for the mobile phone market. 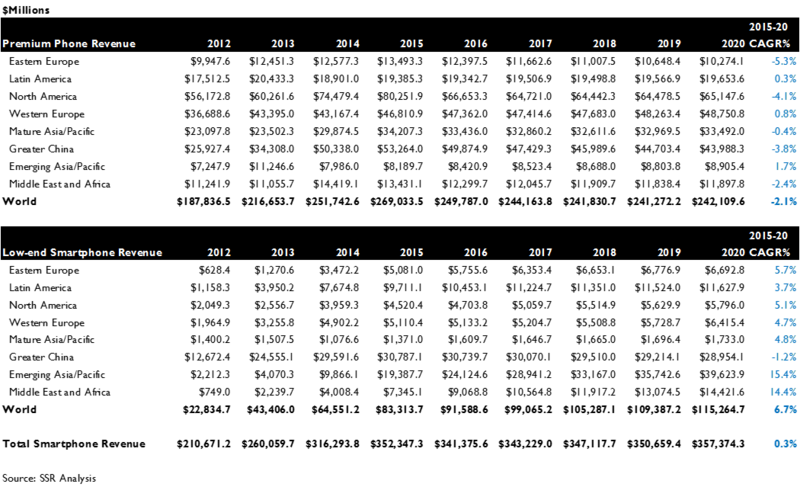 We don’t believe that this is a sustainable trend (Exhibit 14). 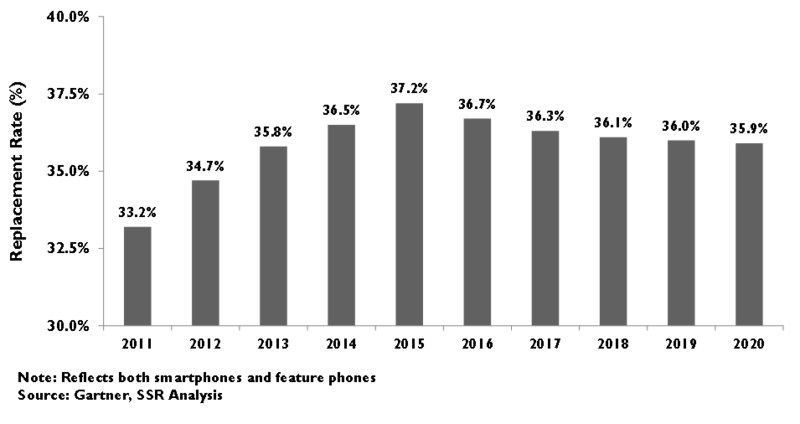 First, premium smartphones, selling for hundreds of dollars, make up more than 55% of phone sales in Western Europe, more than 65% of sales in North America and more than 75% of sales in the mature economies of Asia and Oceania (Exhibit 15). These are markets with stagnant installed bases and historically high replacement rates where we are projecting very little overall unit growth moving forward. Meanwhile, none of the remaining regions of the world has more than 30% premium smartphones in their mix, with the fastest growing markets in Asia and Africa sporting less than 20% premium sales. These are the markets that we believe will yield more than 75% of the global sales growth over the next 5 years, largely catalyzed by the introduction of even lower priced entry-level smartphones. As a result, we believe that premium smartphones will fall from about 27.4% of total phone unit sales in 2014 to less than 24% in 2020, declining very slightly in absolute volume terms over that time. Second, we believe that the nature of mobile phone competition is changing. Apple has done a spectacular job of positioning its iPhone as an iconic and aspirational product and of constructing a web of switching costs and ecosystem interconnection to lock in its famously loyal customers, but the real differentiation of the iPhone vs. its Android powered rivals is slowly eroding. Of course, this is largely obscured by the wild success of the iPhone 6 and 6 Plus, which scored not so much because of their differentiation, but more because they delivered the large screen formats that had previously differentiated Android products from archrival Samsung and others. Screen size, resolution, camera quality, processing speeds, app availability – these major factors for phone buyers a few years from now have hit the point of diminishing returns. It is not clear that the new differentiators – fingerprint scanners, 3D touch, curved edge displays, and other bells and whistles – carry the same competitive advantages for phone manufacturers today. This is opening the door to new competitors from China and India with lower costs, better ties to growth markets and willingness to compete aggressively on price. Huawei, Xiaomi, Vivo, Micromax and Spice are all growing their revenues at substantial double digit annual rates, driven by volume products at lower price points in their domestic markets but fueling their ambitions to move into premium products and international presence (Exhibit 16). The history of mobile handsets is marked by major market share disruptions. The transition to digital in the ‘90’s allowed the future Nordic powerhouses Ericsson and Nokia to displace analog leaders Motorola, Siemens and Panasonic at the top. A decade later, Motorola reclaimed leadership during the RAZR fad, before giving ground to a surging Blackberry. With the 2007 introduction of the iPhone, Apple relegated Motorola, Blackberry and Nokia to the slag heap, with only Samsung really able to keep pace (Exhibit 17). Apple’s position, with its extraordinary array of architectural lock-ins and fierce customer loyalty, will be very slow to erode despite its massive price umbrella. Not so much on the Android side, where leader Samsung and established rivals like LG, HTC, and Sony will see huge pricing pressure from the emerging market upstarts. Overall, we believe that the global blended ASP, which had trended up over the past 4 years with a sharp iPhone 6 related spike in 2014-2015, will turn down again in the second half of the decade. We are projecting a roughly 2% annual decline in ASPs from this year through 2020, essentially offsetting expected unit growth and yielding just 0-0.5% annual industry revenue growth over the period (Exhibit 18). The one bright spot for some wireless technology providers is that smartphone architecture and 3G/4G network service are finally squeezing out the remnants of the feature phone and 2G world that proceeded it. 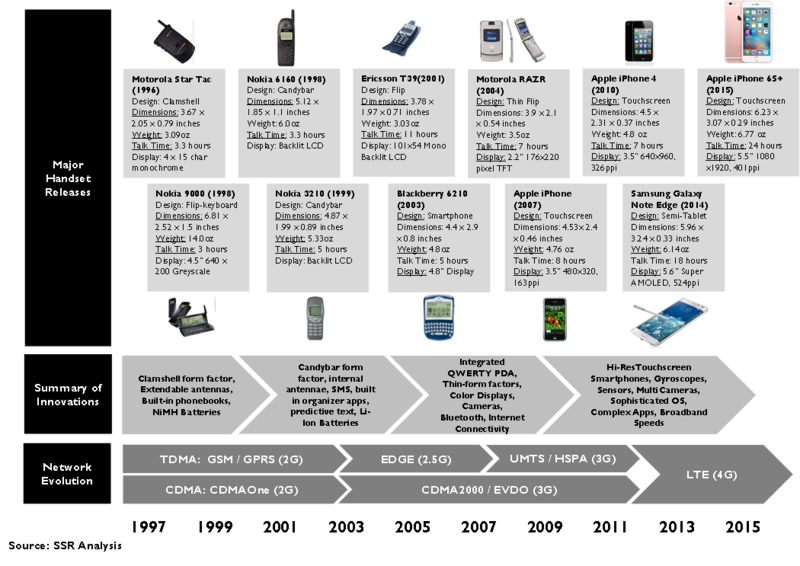 Smartphones – running a standard operating system, like Android or iOS, optimized for data applications and supporting a universe of compatible 3rd party apps – are challenging the domain of vendor proprietary feature phones. Cheap Android models are on sale in India for as little as $40, boasting specs that would have been decidedly premium 3-4 years ago. The Android One program, which defines turnkey hardware configurations able to support the latest versions of the OS at price points below $100, has shown early success with strong sellers in its initial launches in South Asia, Africa and the Middle East, and is aiming to push the program to enable price points below $50. We believe that these low end smartphones will crowd out demand for proprietary feature phones over time, opening opportunity for component makers able to support the specs and not exposed to the dying feature phone business. Companies fitting that description include Qualcomm, MediaTek, Synaptics, Invensense, NXP and others. At the same time, over half of existing wireless subscriptions are for 2G only service. 2G networks are far more costly to operate than 3G and 4G networks, and are considerably less efficient in their use of spectrum. As such, carriers have considerable incentive to expand their 3G/4G coverage and to migrate their users to the more efficient networks. 31% of new phones sold in 2014 were 2G only, a percentage that is expected to drop to 23% this year and 14% next year. We believe that the installed base of 3G/4G phones will expand rapidly, not just with the sales of new 3G/4G enabled smartphones, but also with the spread of used devices in the secondary market. By 2020, we believe that the world’s mobile subscriber base will be 85% 3G or 4G. This is a specific opportunity for Qualcomm, which does not collect royalties or sell chipsets into the 2G GSM market (Exhibit 19). Finally, the global shift to 3G/4G smartphones will be very beneficial to the companies that provide cloud-based services to these mobile platforms. Certainly Google would take advantage of a possible doubling of the base of Android users between now and the end of the decade. Facebook is another clear winner from the global expansion of smartphones. The success of the iPhone is undeniable. It defined the modern smartphone, introducing the all-touch interface, downloadable apps and the basic design language that is now ubiquitous. When naysayers were counting them out after iPhone growth dipped to low single digits, Apple blew expectations out of the water with the wild success of the big screen iPhone 6 and 6 Plus. In a market where total unit growth had decelerated to low single digits, the iPhone posted 46% unit growth for the 2014 holiday quarter and is expected to deliver nearly 28% growth for all of calendar 2015 (Exhibit 20-21). iPhone pricing is defying gravity, with ASPs up 17% YoY in recent quarters, a reversal of the downward trend before the launch of the new models. So why the long face? We believe that the iPhone 6 and 6 Plus, having finally satisfied a pent up demand for larger screen models, pulled substantial replacement demand forward. After December earnings, CEO Tim Cook noted that nearly 15% of the 400M strong iPhone installed base had upgraded to the new products during its first quarter of release. After March earnings, he noted that 20% of the current installed base consisted of upgraded iPhones. Shifting the denominator to the 400M base at the launch of the product raises this slightly to 22.5%. While Cook went out of his way to depict this upgrade activity as unremarkable, we note that the global average upgrade rate in 2013 was 35.8% for the full year. We also note that US replacement, in Apple’s biggest market, jumped 680bp, roughly 25M units, in 2014 with no other obvious explanation than the iPhone 6/6+ launch. While Apple has undoubtedly taken market share with its new phones, the real number of brand switchers is likely far more modest than it may seem at first glance. Apple sold 135M total iPhones during its 1HFY15, of which some 110-120M were the flagship models. Given that 90M (20% of the 450M base) were upgraded Apple customers, just 20-30M came from new subscribers and brand switchers. Against global Android smartphone sales of better than a billion units in 2014, this is minor phenomenon. Furthermore, the iPhone installed base consists not just of devices in use by their original purchaser, but also a sizeable population of used models that have been passed down or sold to others, and thus, less likely to be replaced with a new iPhone purchase. We estimate that total sales of used premium smartphones was about 19% of the unit volume of new product sales in 2014, or 97M units. Assuming that used iPhones make up a disproportionate share of that volume, a quarter or more of Apple’s installed base may be older models in the hands of a second owner. In this context, we believe that the pace of upgrades within Apple’s installed base will likely cool in the year ahead. It will be very difficult, given the generally stagnant addressable market for premium smartphones, eroding product differentiation and rising completion, for the iPhone to generate meaningful sales growth. Where Could We Be Wrong? 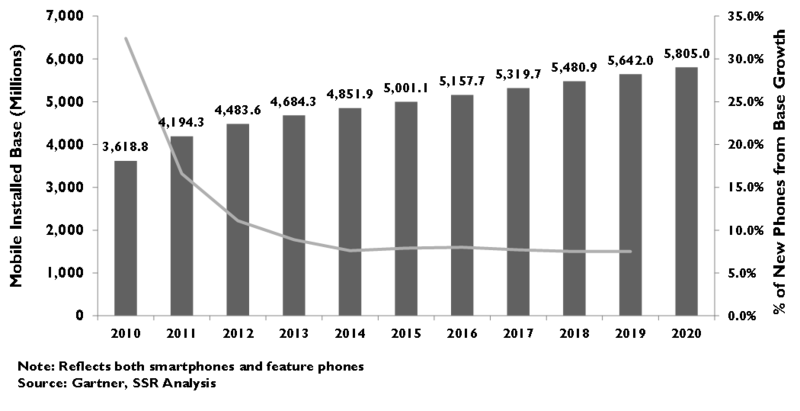 In our model, we assume global replacement rates peaking in 2015, with the inflection point catalyzed by the elimination of subsidies in the US and other markets, the natural consequences of iPhone replacement borrowed forward, by a shallower curve of innovation and differentiation year to year, and by the lower replacement rates in the markets that we expect to deliver the large majority of future growth. We do not believe that annual trade-in programs are likely to be popular enough to support rising replacement rates against these headwinds, and if they are extremely popular, we believe that the influx of used premium smartphones would bring down prices in the secondary markets and erode the economics of the program itself. If these assumptions prove incorrect, replacement could move higher on a global basis and add significantly to the volume sales that we are projecting. The other key assumption is declining average selling prices. We believe that a substantial mix shift toward very low priced smartphones is underway in many regions, and as we expect that the emerging markets where these products are popular will deliver more than 75% of the industry’s unit growth over the next five years, the impact on prices could be considerable. In addition, we believe that a lull in real product differentiation has opened the door to aggressive Chinese and Indian mobile phone makers, who have already begun to offer unusually well spec’ed devices at significant savings vs. established global brands. We anticipate competition from these companies to push ASPs in both premium and basic categories lower with time. However, our assumption that product differentiation will not support rising premiums for leading brands and products could prove incorrect. If so, prices could decline less steeply than we have assumed or even rise within certain markets. We believe that market data broadly supports our conclusion that the extraordinary growth in iPhone sales over the past three quarters was driven, in part, by accelerating replacement decisions by existing Apple customers and that this phenomenon will yield lower replacement activity by these customers in subsequent quarters. This conclusion will be tested in Apple’s 1QFY16. On the other side, we may have been overly optimistic about growth in the global installed base. Our model assumes a slight acceleration in base growth on the assumption that lower prices will stimulate a new segment of global consumers to enter the market. If this doesn’t happen, growth could drop below the current 3.1% annual level, with the obvious effect on new phone sales. We also note that our replacement assumptions, while predicting an inflection point also forecast an extremely gentle downward trajectory going forward. Our 2020 assumed global replacement rate of 35.9% of the installed base is still higher than any year before 2014. It is possible that our assumptions are too optimistic and that replacement rates would fall back to the 33% level. This would yield a dramatically lower unit demand going forward.